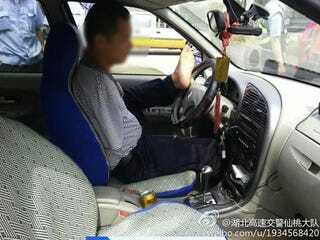 After a 45 year-old man surnamed Guo was pulled over in Hubei, China, it was discovered he was was driving without a license. He was, however, driving with his feet. As reported by Xinhuanet and ShanghaiIst, Mr. Guo lost his arms at the age of seven after accidentally touching a high-voltage cable. He's learned how to use his feet to do everything—from wash his face and brush his teeth to write letters and, well, drive. The problem is that Guo couldn't get a license under Chinese law. So while he's been driving illegally, racking up nearly one hundred thousand miles in the process, he did purchase insurance for the car he bought. And Guo claims he's never had an accident! While driving without a license in China can mean up to fifteen days in jail, the police gave Mr. Guo a verbal warning and a 500 yuan (US$80) fine. How about giving the guy a round of applause for buying insurance and not apparently not getting in accidents?